Charmed was one of the more successful 1990s TV serials about the supernatural. It ran for a robust 8 seasons (no movie, though it spawned a number of novels and comic books) and acquired a large and dedicated following. It chronicles the struggles, both mundane and magical, of 3 sisters who discover that they are witches with powerful magic powers and a shared destiny. Known as the Charmed Ones, the Halliwell sisters are further armed with the powerful Book of Shadows, their ancestral grimoire. The show’s main hooks were a mostly female cast – and the ability to mix genres from light horror to urban fantasy to soap opera. Though it occasionally veered into camp or even “jiggle TV”, at its heart the show was about family and the bond between the sisters. Our current Charmed profiles are solely based on the first season of the TV show (1998-1999), and come with S P O I L E R S. There are also small, indirect spoilers for later seasons. Writeups.org’s Charmed profiles are dedicated to the memory of Phyllis “Figgy” Ann Flannery Kyle, killed by a drunk driver on Jan 18th, 2008. Charmed was her favorite show. Other Aliases: “Pheebs” (a nickname). Known Relatives: (Partial List — not including relatives whose existence is unknown in Season 1): Prudence “Prue” Halliwell (sister), Piper Halliwell (sister), Victor Bennet (father), Patricia “Patty” Halliwell (mother, deceased), Penelope “Penny” Halliwell (grandmother, deceased), Melinda Warren (great, great, great, great, great, great-grandmother, deceased progenitor of the line of Warren witches), and assorted other Halliwell/Warren/etc. foremothers (see the Charmed Wiki for a complete listing). Group Affiliation: The Charmed Ones. Base Of Operations: Halliwell Manor, San Francisco CA, USA. Height: 5’2” Weight: 110 lbs. Eyes: Brown Hair: Dark Brown. Phoebe Halliwell is descended from a long line of magical witches (somewhat like the DCU’s Homo Magi or the Marvel Universe’s New Salemites), as distinct from a normal, non-powered person who takes up the practice of witchcraft. As a magical witch, she can cast functional spells through rituals and brew magical potions. She can also perceive most ghosts, and perhaps other magical creatures that are typically invisible to humans. At this point Phoebe is very much a novice witch, with little real occult knowledge. She hasn’t yet learned to create original spells or potions (though she will be the first of her sisters to do so, in later seasons) and can’t identify most magical creatures. However, she is the most excited of her sisters to learn about witchcraft. She has spent the most time studying the Book of Shadows, their ancestral tome, full of the lore of generations of Warren witches. Using the Book, Phoebe can cast a variety of spells. Most of them are specific vanquishing spells for specific demons and warlocks, but they also include a Truth spell, love spells, charms to summon an ancestor’s spirit, travel through time, exchange powers with another witch, multiply one’s strength (by creating magical duplicates), etc. True witches in the Charmed Universe are also born with a unique power of their own (much like a mutant or metahuman), a special gift which grows stronger over time and may even develop into additional powers. 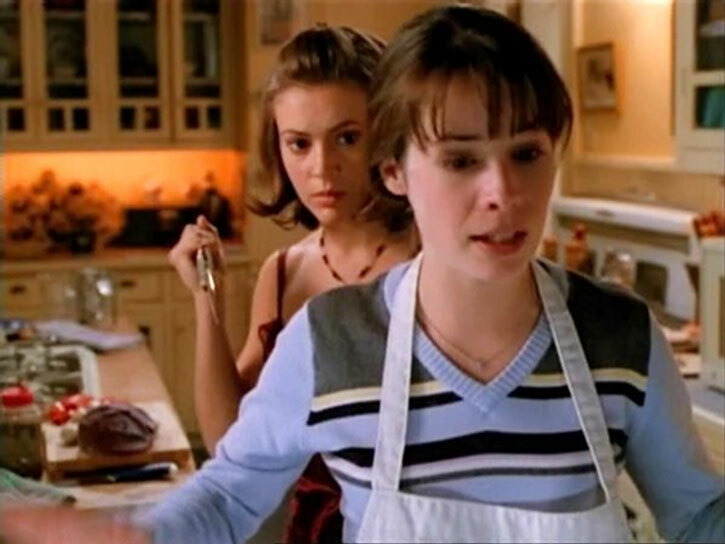 In the case of the Charmed Ones, each sister received one of the three powers practiced by Melinda Warren, namely to move objects with the mind, freeze time, and see the future. Phoebe received the latter gift, the ability to see the future (Precognition, as noted in the section for DC stats). She generally refers to her visions as “premonitions,” but as her power has advanced, her “premonitions” may also be glimpses of the past (Postcognition). Generally the visions come on their own; she can call a premonition on command only with great difficulty. Nor do her powers warn her of all dangers; but her visions are the Charmed Ones’ most frequent guide to innocents who need help. As her ancestress Melinda Warren told her, Phoebe’s visions allow her to protect (by giving early warning of danger to others, allowing Phoebe and her sisters to intervene) and to heal (by showing her past wrongs or hurts and giving her clues to resolve them). The passive nature of her powers, as compared to those of her sisters, has often frustrated Phoebe. Early on, when facing enemies, she was reduced to huddling behind Prue and Piper and shouting suggestions while they fought. Or, while they kept a demon busy, she would run to the Book of Shadows and look for a spell that could help. Her frustration at taking a more passive role led her to start an aggressive study of the martial arts, and there are suggestions in later series that her powers are part of what helps her advance so rapidly. Without a teacher and practicing in secret for a few months, she has achieved a formidable level of skill. She can now hold her own with most warlocks (if she’s close enough to them), and can knock down or even KO demons that resist bullets. Phoebe is the most “street smart” of her sisters. She has a variety of useful “real world” skills, including the ability to pick locks and pockets. She’s intuitive and persuasive, able to gain the trust and cooperation of others. She is skilled at tracking down information, whether in a database, in the Book of Shadows, or persuading people to confide in her. A cut of key scenes in the first season of Charmed, made as a recap. Phoebe is one of the Charmed Ones, three sisters prophesied to become the most powerful witches the world has ever seen, wielders of the Power of Three. She is powerful individually, but when united with her sisters, their bond enhances their collective strength. With the Power of Three they are capable of defeating almost any magical threat. The Power of Three seems to manifest when the sisters cast a ritual spell. Most often that involves casting a vanquishing spell for a demon or warlock. In fact there are vanquishing spells in the Book of Shadows that can only be cast with the Power of Three. But the Power of Three enhances any spell the sisters cast. One example of this was in That 70s Episode. The Charmed Ones’ grandmother, Penny Halliwell, wrote a time travel spell, but by herself wasn’t powerful enough to make it work. Penny and her daughter Patty, the girls’ mother, were able to cast it together, but only enough to travel a few seconds through time. When the spell was invoked using the Power of Three, it moved the girls across decades. In the Charmed Universe, as in the DC Universe, magic has its price. In this case, good witches like the Charmed Ones have four Subplots constantly hanging over their heads. First, warlocks and demons are constantly out to kill witches and steal their powers. As a result, Phoebe and her sisters are subject to attack at any time, any place, without warning. They are also sworn to defend the innocent (typically defending them *from* the warlocks and demons), and are liable to encounter people in trouble unusually frequently. There is a strong element of “destiny” or “fate” in the series, with the Charmed Ones encountering people they are “meant” to help. 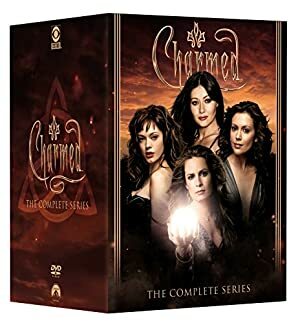 As both targets for evil and defenders of the innocent, the Charmed Ones encounter trouble about as often as if they lived on a Hellmouth (or as if they were super-heroes). Third, good witches are sworn not to use their powers for personal gain, a witchly variation on the DCU’s Magician’s Code. Breaking this rule will always lead to unforeseen consequences which the GM should inflict as appropriate. Generally, they are related to the spell or power used. For instance, casting a spell to attract true love might summon dozens of potential suitors, all fighting over the witch. A spell to cure a loved one of disease might just shift that disease to an innocent, or even many innocents. Depending on the degree of personal gain (and the mood of the GM), the consequences may be dire. They will often be embarrassing, inconvenient, and sometimes silly (almost as if the characters are on a sitcom…). Phoebe’s use of her other powers for personal gain may also have consequences. Once she received a premonition with a winning lottery ticket number. Buying the ticket, she saw it magically wiped blank moments before she could claim her winnings. Repeated selfish use of her powers should lead a GM to start potentially dangerous Subplots. Finally, witches work to conceal their identities and the existence of magic. In the first season this mostly functions as a garden-variety Secret Identity. As time goes on, it gets closer to being a Dark Secret. 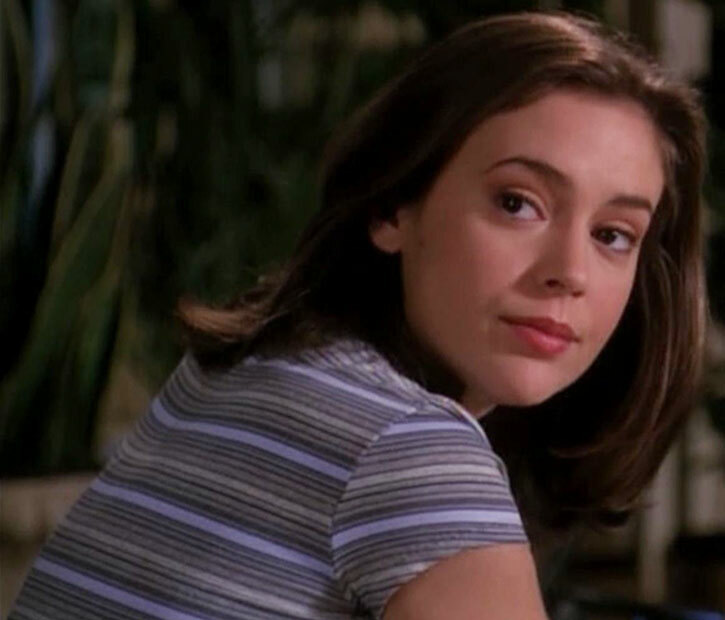 Phoebe Halliwell is the youngest daughter of Patricia “Patty” Halliwell and Victor Bennet. The couple had two other daughters, Piper and Prue. Patty and Victor split up when the girls were young, and shortly thereafter Patty was killed. The trio was raised by their maternal grandmother, Penelope “Penny” Halliwell (“Grams”), in the family’s Victorian manor in San Francisco. The Halliwells are descended from Melinda Warren, a powerful witch with the ability to move objects with her mind, freeze time, and see the future. Melinda died in the Salem witch trials in 1692, but her daughter and Book of Shadows survived. She also passed down a prophecy. Melinda said that each generation of Warren witches would grow more powerful, culminating in the eventual arrival of the Charmed Ones. These three sisters, each possessed of one of Melinda’s powers, would become the most powerful witches the world had ever seen. Together they would wield the Power of Three, defend the innocent, and vanquish many terrible evils. Over time the family name changed to include Russells, Bowens, Halliwells, and others, but the line of Warren witches thrived. Each generation added new knowledge and spells to their Book of Shadows, so that eventually it became coveted by evil forces as one of the most magical of all tomes. Much of the book consisted of vanquishing spells designed to destroy specific demons and warlocks. Many of these spells required the Power of Three, and thus could not be used by the Warren witches who devised them. They were a trust passed down to future generations, ensuring the Charmed Ones would be well armed to fulfill Melinda’s prophecy. By the early 20th century the family had migrated to San Francisco. They moved into a Victorian manor built atop a nexus of spiritual energy. That energy could be used for good or for evil. By moving there, the family claimed the power of the Nexus for the forces of good, yet another way of preparing for the Charmed Ones. Prue, Piper, and Phoebe were destined to fulfill this long-awaited destiny. However, when the sisters were still young (Phoebe was actually in utero), a warlock named Nicholas attacked their mother. Nicholas got the drop on her, but he didn’t want just her powers. He wanted her daughters – all three of them, including the unborn Phoebe, which he couldn’t take until she was born. Patty struck a bargain with Nicholas that would give him the opportunity to claim all three powers while holding him at bay, not immediately killing her and settling for Prue and Piper. She gave Nicholas immunity to her daughters’ powers, gambling that she and Penny could protect the girls until they found a way to defeat Nicholas. To ensure that he didn’t immediately kill the girls and claim their magic as soon as Phoebe was born, Penny and Patty decided to strip Prue, Piper, and Phoebe of their powers. Nicholas would have to leave them untouched until their powers were restored if he wanted to take them. Prue and Piper forgot ever having been witches, hinting that Penny may have also blocked their memory. Certainly, from this point on, Penny and Patty actively concealed the existence of magic from all three girls. Possibly they didn’t want the girls to know about magic because they might have wanted their powers back before they were ready. With Nicholas temporarily stymied, Patty was able to carry Phoebe to term. She was actually born in the Halliwell manor, giving her a special connection to it and to the Nexus. Despite the safe and happy birth, Penny and Patty didn’t find an immediate way to vanquish Nicholas, and the girls’ powers had to stay blocked indefinitely. Nicholas kept his distance, no doubt to avoid confrontation with Patty and Penny, keeping an eye on the family to watch for signs that the trio had regained their powers. This didn’t prevent other warlocks and demons from targeting the family, or release Patty and Penny from their own obligations to protect the innocent. Victor wanted the entire family to renounce magic and live normal (safer) lives, and it was this long-standing argument that strained Patty and Victor’s marriage. In 1978, Patty was killed battling a water demon, leaving Penny (“Grams”) to raise the girls alone. Unknown to the sisters, their father also wanted to raise them, but Grams wouldn’t allow it. He was a mortal and couldn’t, in her view, raise or protect the Charmed Ones. Penny continued to battle and defeat various demons, all the while hiding the existence of magic from the girls. When Phoebe was five, she actually walked in on Grams’ battle with a shadow demon in the basement. Though her sisters always chalked her story up to childhood imagination, the demon was very real, and Phoebe saw Grams bind and imprison it in the earth with the power of the Nexus. Phoebe had a lifelong fear of this “Boogey Man”, which her five-year-old self pronounced “Woogie Man”. For years she refused to go in the basement. Grams did not let on that the “Woogie Man” was real, but she taught Phoebe and her sisters a “story” to help the children face fears of the Woogie Man. The story included a rhyme which she made all the girls memorize. Phoebe wasn’t yet three when her mother was killed. Her father left shortly thereafter. Phoebe had little or no memory of them, leaving her with a sense of being orphaned. While Grams raised the three girls, Prue, as the eldest, also tried to fill the role of parent. Prue grew into a hyper-responsible, over-achieving popular girl who held herself and her sisters to an impossibly high standard. Piper was shy and just wanted everyone to get along, but Phoebe became known as the noisy, reckless, and rebellious sister. A bright student who once earned an award for Student of the Month, as a teenager Phoebe began to act out, partying and committing minor acts of vandalism and shoplifting. As the sisters reached their twenties, Grams began to suffer ill health. Concern for her was often the only thing binding the three sisters together. With Nicholas still on the loose and the sisters’ relationship in disarray, Grams didn’t dare return their powers or tell them of their destiny. Even before her death in April of 1998, the girls were splintering. Prue was pursuing her career and had become engaged to a man named Roger, who hit on Phoebe. Phoebe rebuffed him, but the rift between her and Prue grew wider than ever when Prue believed Roger’s story that Phoebe had come onto him. When Grams died, Phoebe decided to strike out on her own. To Prue’s great disapproval, she dropped out of college. Prue was even more infuriated that Phoebe had decided to try and find their father, pursuing leads that had him living in New York City. Though she didn’t find Victor, she did gain life-experience in New York. She met Clay Muniz and he helped her get a start there. Phoebe worked three jobs just to afford her social calendar. She barely made ends meet but was a quick study at anything she wanted to learn and picked up many handy, if questionable, skills from her boyfriends. Among other things, she learned to handle a wrench, hotwire cars, and pick locks. Phoebe stayed in contact with Piper throughout her time in New York, but had no contact with Prue. Eventually Phoebe settled into a serious relationship with Clay Muniz. Clay was handsome and exciting, a bit of a bad boy who genuinely fell in love with Phoebe, and she with him. But despite their mutual bond, Clay took too many chances and got involved in too many shady and illegal undertakings. Phoebe, the “reckless” and “irresponsible” Halliwell, knew that Clay was too reckless and irresponsible to be safe, and she left him. About six months after Grams’ death, Phoebe moved back into the manor, broke, unemployed, and at loose ends. Things between Prue and Phoebe remained tense, and Piper was caught in the middle. Prue felt Phoebe was irresponsible and unfocused, having no vision for her future. Phoebe felt Prue was overbearing and hyper-critical, more like an overprotective parent than a supportive sister. Prue also continued to believe that Phoebe had come onto Roger, instead of the other way around. Prue had broken off her engagement, but still harbored resentment toward Phoebe. In the midst of this family drama, Phoebe discovered the Book of Shadows in the attic and learned the family’s true history for the first time. She recited a spell she found in it, the Dominus Trinus, to call for their powers. As Grams’ power block had died with her, the spell worked. Phoebe gained the power to see visions of the future, Piper could freeze time, and Prue could move objects with her mind. All the sisters were shocked. While Phoebe was excited, Piper was mostly scared, and Prue was angry. But the sisters were forced to come together to fend off Piper’s fiancé Jeremy. He was secretly a warlock who had deduced their true identities and had been waiting for their powers to be released. He intended to kill them and claim their powers for himself. Working together, Prue, Piper, and Phoebe tapped into the Power of Three and vanquished Jeremy. Over the next year, the three sisters tried to balance their new lives as witches, individuals, and sisters. Each reacted in a different way to their powers. Phoebe was enthused by their new lives. She concentrated on learning about witchcraft and didn’t give much thought at first to her personal life. She took temp jobs when she needed them and walked off them when she didn’t. In the meantime, she learned about magic and read the Book of Shadows. At first Phoebe saw becoming a witch as a grand adventure. She looked for “fun” spells to try out, and initially was quick to try and find ways around the prohibition on using magic for personal gain. Phoebe once even convinced Piper to join her in casting an “attract a mate” spell from the Book of Shadows. As this was certainly an instance of personal gain, the spell backfired with comical results. But while Phoebe was certainly enjoying magic, her first experiences of saving innocents had a profound impact on her. Saving someone was a high she’d never experienced. She quickly came to see her magic as a gift, and came to value the ability to make a difference. She also did a lot to help her sisters accept their powers. She helped Prue discover how to trigger and control her telekinesis – mostly by intentionally making her angry – and she helped Piper deal with her fears. Piper wasn’t just afraid of warlocks and demons; she was also afraid of the loss of her normal life, and wondered if her powers could really be good. Phoebe listened to her fears and gave her supportive advice, assuring her that their powers were meant for good; to protect the innocent. Phoebe’s one frustration with their newfound powers was that her gift was passive, affecting no one but her. Both her sisters had active powers that had physical effects. But the truth was that the Charmed Ones needed each other; all their powers were essential. The trio faced and defeated a number of magical threats, saving themselves and innocent bystanders on many occasions. The situation forced them to work together, inevitably bringing them closer as they learned to rely on each other. Those family ties were strengthened further when they met their ancestor Melinda Warren. The sisters used a spell to summon her from the past so she could help them against her old nemesis, a powerful warlock named Matthew Tate. Melinda taught them the spell they needed to defeat Nicholas; she also encouraged and affirmed them. Phoebe, in particular, bonded with her. Melinda helped her see new value in her powers, which gave her the opportunity to protect others and right wrongs. The girls’ father, Victor, reappeared in their lives very soon after the sisters obtained their powers. While Piper and especially Phoebe were excited to see Victor, Prue met his return with anger and suspicion. While Prue kept her distance, Piper and Phoebe set a dinner date with Victor. But Phoebe, too excited to wait, went to Victor’s hotel alone and met with him early. The meeting was good, but awkward. Victor at first guessed that Phoebe was Piper, not recognizing his grown-up daughter. And when father and daughter hugged, Phoebe had a vision of Victor stealing the Book of Shadows. Phoebe didn’t want to believe it, but when evidence turned up that someone was trying to steal the Book she was compelled to tell her sisters. Confronted, Victor confessed that he hoped to steal the Book and thereby force his daughters to live safe, normal lives. In the end, Victor helped the girls protect the Book of Shadows against a trio of demonic shapeshifters, and in the process saw that they were capable of taking care of themselves. Father and daughters seemed to be reconciled and ready to develop a new relationship. Then, without any real explanation, Victor unexpectedly left town again, disappearing once more. When Nicholas discovered the Charmed Ones had finally accessed their magic, he attacked. The three sisters used a time travel spell to go back to the 1970s for help and information. The adult Halliwell sisters were able to work together with their mother and grandmother, and even their own past selves. They ultimately defeated Nicholas while reaffirming their family bond. Not only had they finally defeated Nicholas; Phoebe now finally had memories of her mother. A demon attack early in the year caused some damage to the manor, something that would occur all too frequently. The sisters contracted with a handyman, Leo Wyatt, to make some repairs. The manor was attacked so frequently that the sisters had to call on Leo regularly, and he became a fixture in their lives. Piper had an immediate attraction to Leo. Phoebe competed with Piper for Leo’s attention but under the power of a truth spell conceded that she liked Leo only because Piper did. Phoebe, with some ’encouragement,‘ reluctantly stepped aside. Clay Muniz made a surprise return to Phoebe’s life when he needed help to auction off a valuable Egyptian urn of great antiquity. Knowing that Phoebe’s sister worked for an auction house, Clay asked Phoebe for her help. The pair briefly reunited, rekindling their romance. But Clay was once again in trouble. The urn was stolen and it was also cursed with a powerful magical guardian who would kill thieves. The guardian of the urn killed his two partners in crime and came for Clay as well. The powers of the Charmed Ones were useless against the guardian, but when Clay was prepared to sacrifice himself to save Phoebe, the power of his selfless act broke the curse. Still, though Clay had once again proven how much he cared about Phoebe, Phoebe knew she couldn’t leave her sisters to return to New York. They once again parted ways, Clay promising to be a better man and turn himself in for his crimes. During a minor earthquake, the basement floor cracked. The sisters feared a gas leak, but the real danger was much worse. The quake released the Woogie Man that Grams had sealed away years before, when Phoebe was five. The Woogie Man intended to take control of the house and claim the power of the Nexus for evil. First it possessed the man from the gas company who came into the basement to check things out. Then, using Phoebe’s innate connection to the house and the Nexus, it possessed her, enhanced her powers, and used her to eject Prue and Piper from the house. When Prue and Piper tried to fight back, the Woogie Man forced Phoebe to fight them. But Prue and Piper realized that the rhyme Grams taught them years before wasn’t just a story. It was actually the spell that would seal the Woogie Man away again. Not having paid the story much attention, the elder Halliwell sisters weren’t able to remember it clearly. But with their encouragement, Phoebe was able to resist the Woogie Man long enough to recite the spell and vanquish the demon back into the basement floor. At her sisters’ urging, Phoebe then became the first of the three sisters to add to the Book of Shadows. She recorded the story of the Woogie Man and the spell to vanquish him so it would be there for future generations of Halliwells. During one of Leo Wyatt’s many visits to repair damage to the manor, Phoebe walked in on him levitating to change a light bulb. She became immediately alarmed, assuming he was a warlock. The truth was far stranger. Leo explained that he was a magical being known as a whitelighter, a heroic mortal who died but was given new life as a sort of guardian angel for witches. He had been sent to secretly protect and guide the Charmed Ones, but his blooming relationship with Piper was forbidden. He was under orders to break up with her and break off contact with them. Phoebe agreed to keep Leo’s secret, though in a fit of guilt she did actually blurt out the truth to Piper and Prue. They thought she was joking…until Leo returned, needing the help of the Charmed Ones to protect another of his charges. By the end of the year, there were five who knew the Halliwells’ secret — the Charmed Ones, Leo, and Andy, Prue’s sometime-boyfriend and an Inspector with the San Francisco PD. Piper and Leo still had to work out their relationship knowing that the Elder whitelighters forbade them to be involved. Meanwhile Andy wanted a normal life and had trouble accepting Prue’s powers. Their personal relationship remained uncertain. But now that Andy knew the truth, he began to work with the sisters, helping them protect their secret while also protecting innocents. Unfortunately, that secret was in jeopardy. Warlocks like Nicholas and Jeremy, who knew the Charmed Ones’ true identity, were in the minority. They didn’t share their knowledge with the leaders of the Underworld, because they coveted the Halliwells’ powers for themselves. But someone or something had noticed that demons and warlocks in the San Francisco area were suddenly being destroyed at an alarming rate. Prue’s bosses, “Rex Buckland” and “Hannah Abbot”, turned out to be warlocks sent to investigate. Though they were defeated (with Leo’s covert help), they had passed on their suspicions that the Halliwell sisters were secretly the sisters of legend, and new demons were sent to investigate. One of these demons took a cover identity as Inspector Rodriguez, working for internal affairs in the SFPD. Knowing there was a connection between Andy and the sisters, he pressured Andy, who chose to accept suspension rather than betray the sisters. Rodriguez nevertheless managed to confirm his suspicions about the sisters by magically eavesdropping on Andy. With the Charmed Ones’ identities finally confirmed by the Underworld, a being called only “The Source” sent Rodriguez reinforcements. An upper-level demonic dignitary named Tempus aided Rodriguez by creating a time loop. This ensured that he would survive any failed confrontation with the Charmed Ones, starting the day over to try again. In Rodriguez’s first attack, Phoebe was killed before he was vanquished and the day was restarted. When the loop repeated, Rodriguez adjusted his attack, and this time both Phoebe and Piper were killed. Phoebe’s powers made her aware of the manipulation of the time stream and the sisters began to fight back. It still took Andy Trudeau sacrificing his life for the sisters to gain the upper hand in the third time loop. They defeated Tempus and vanquished Rodriguez. At year’s end, the sisters were temporarily safe. But Andy was dead and the mysterious Source was still a looming threat. Phoebe is a fit, petite, attractive woman. She has brown eyes and brown hair, generally shoulder length. Her free spirit comes out in her hairstyle and clothing choices, which are in constant flux and are less reserved than her sisters. Her most often worn hairstyle is simply down about shoulder length and parted in the center. Phoebe dresses for the occasion. For a job interview she will “borrow” from Prue or Piper’s wardrobes – usually Prue’s, as Prue’s stylish, quality clothes appeal to her. When going out she wears dark colors and high heels and doesn’t hesitate to show off her good looks and figure. In short, Phoebe is a fearless, good-hearted but rule-breaking and fun-loving troublemaker. She is outgoing, fun, and loves attention. Unlike Prue, with her refined sensibilities, Phoebe is more down to earth. She’s adventurous, a trait both Prue and Piper admire. Phoebe’s rather proud of that herself, and encourages her sisters (and others) to take chances too. She is always up for excitement. As mentioned previously, she approached the discovery of magic with the same fearless, fun-loving attitude. The flip side of her outgoing attitude is that she’s sometimes reckless. She doesn’t like to back down or admit mistakes, something she has in common with Prue, and the clash of their strong wills often leads to friction. Phoebe’s reckless side also comes out in her tendency to hang out with the bad boy crowd. She finds men with an edge of danger or mystery attractive. She’s a romantic, though, and has a good heart; she wants the edge but not the truly bad boy. The rebel with a heart of gold is more her speed. In any case she’s young, she’s just found out she’s a witch, she’s having adventures. She’s not looking for anything serious just yet. While outgoing and attention-seeking, Phoebe is very sensitive to others. In fact she’s particularly intuitive and observant. She has an ability to make strong connections, is a good listener, and gives supportive and sound advice. Her ability to connect with people means she is often able to gain the trust and cooperation of innocents in a crisis situation. Her romantic side often comes out in her interest in Prue and Piper’s relationships. She often encourages them to date and to open themselves up to love even if it’s a risk. ”Give to get” is one of her mottos. One aspect of Phoebe’s sensitivity is that she is impacted more than she will admit by criticism, especially from her sister Prue. Prue’s disapproval over the years contributed to her rebelliousness, as she wouldn’t admit how much she wanted Prue’s praise. The truth is that Phoebe deeply loves her family. Her feeling that she “missed out” of having a father or mother makes her long for connection. Through magic she got the chance to reunite with both her parents, and to get a better relationship with her sisters. That is one of the things she loves most about being a witch. One of her greatest fears, on the other hand, is losing a sister. Another of Phoebe’s great fears is of her own dark side, which is one of the reasons Prue’s criticisms about recklessness affects her. The Woogie Man targeted Phoebe for possession, rather than Prue or Piper. She fears that this means she is more susceptible to evil than her sisters. Piper assured her that she was targeted only because she was born in the house and had a connection to the Nexus. But Phoebe pointed out that the power of the Nexus was neutral – it could go either way, good or evil. Maybe she was the same. This is a fear she will continue to wrestle with in later seasons. See Piper’s writeup for the full version of this. But basically the Charmed Ones are already super-powered heroines with a magical “flavor” so they’d fit well in a superhero RPG. Some aspects of the Charmed cosmology, especially from later seasons, would need adapting. Whitelighters would inhabit the Realm of the Just Dead. In later seasons the Charmed Ones encounter the Angel of Death and Angels of Destiny. These would obviously be manifestations of (or servitors to) the Endless. In the Marvel Universe, the Halliwells and the other witches they encounter would be a collateral branch of the witches of New Salem who chose not to hide among magical folk, but try and live normal lives. This is a recurring theme of Charmed and would fit well. Inevitably the Charmed Ones would adventure alongside the Scarlet Witch and Agatha Harkness (who might have a thing or two to say about ’the most powerful witches ever seen’). Nicholas Scratch and the Salem’s Seven would be fun foes vs. the Power of Three. Similarly, in the DCU, the Halliwells and other magical witches would be Homo Magi, descendants of collateral branches of that race that did not go to another dimension like Zatanna’s people did. They’d be part of the DCU’s mystical community, and show up in crowd scenes during universe-wide crises (as in Crisis on Infinite Earths #12), meeting with the other mystics to pool their powers and help the super-heroes. While they’d be outclassed against Dormammu, Baron Mordo, or Wotan, I could easily envision them battling Dr. Strange foes like Demonicus and Adria the Witch. Such foes would seek the Halliwell Book of Shadows (a prize in any universe) as a way to enhance their own powers before once again battling their old foe Dr. Strange. The sisters might also clash with someone like Tala as she attempted to seduce innocents and take their souls. A being like Klarion the Witch Boy would also make for a good encounter. As San Francisco is obviously Gateway City, the sisters would have encountered Wonder Woman and Etrigan/Jason Blood during their time in Gateway. When Morgan Le Fay was kidnapping immortals like Etrigan, she’d also kidnap Leo Wyatt. Or you could replace or supplement these contacts with Daimon Hellstrom and Patsy Walker Hellstrom, who as Hellstorm and Hellcat were occult adventurers based in San Francisco. Phoebe has much in common with Hellcat, another martial artist with psychic skills. It could be a lot of fun to have the Charmed Ones in the Harry Potter Universe. It would be problematic to have them attend Hogwarts. I don’t see adults like them, who want to live normal lives, packing up and moving into an English boarding school for witches and wizards, even if that were allowed. Moreover Hogwarts is a regional school, operating in the UK, not world-wide. One option is to have an alternate Potterverse universe where the sisters attended Hogwarts as children. Maybe Hogwarts is for American and UK students, or perhaps Penny wanted the Charmed Ones to train with Dumbledore and got special dispensation for them to do so. Perhaps Penny also got help dealing with Nicholas from the Wizarding World, and so felt free to restore the girls’ powers. So at age 11, each went off to Hogwarts. Prue would certainly be Sorted into Gryffindor. Piper would likely be placed in Hufflepuff, though if the Sorting Hat saw her more hidden qualities she too might be a Gryffindor. Phoebe, like Harry Potter, could perhaps go more than one way. She might be tempted by the bad boy vibe of the Slytherins, or her native smarts might lead her to Ravenclaw. But I think her innate empathy and compassion, and her courage, would lead her to Gryffindor. She’d be of the same stripe as Fred and George Weasley, a troublemaker and rulebreaker with a good heart. With the formalized training the sisters would acquire occult skills more quickly than they did in their series. Broomsticks and wands would be something new for them. I imagine the wands would help them focus for individual casting. Phoebe would be the best at flying, which she’s always wanted to do. Penny would certainly not let them bring the Book of Shadows, but would supplement their books from Hogwarts with their own book during breaks. Penny’s skills as a potionmaker would be known to Snape, I think, and Professor Trelawney would take an interest in Phoebe — much to her dismay. But while all this could work, you’d lose much of the distinctiveness of the Charmed setting, and the element of the girls growing up without magic and having to cope as adults. So here’s how I would have the universes co-exist. There are lots of disadvantages to lacking the formalized set-up of the European schools – no easy access to wands to augment a beginning witch’s power and enable easy spell-casting; no easy access to brooms; no Floo network or Portkey network for teleportation; no Ministry of Magic to regulate wrong-doing; etc. But there are advantages, too. It’s clear in the Potterverse that wizards can exert some power without a wand, but it’s a wild talent that never gets trained. Instead they become dependent on the joining of their natural powers with the power of a wand to cast any spells. U.S. witches like the Charmed Ones aren’t so handicapped. The U.S. witches did…something, or train in such ways, that their raw, natural ability is channeled into discrete superpowers that they can use without any ritual or wand. Plus, no Ministry of Magic also has benefits! I imagine the Charmed Ones being called in as guest lecturers at Hogwarts. The Power of Three and the many evils they vanquished would make them celebrities almost equal to the Boy Who Lived. Season 6 of their show introduces a Magic School — one obviously patterned after JK Rowling. In the show the School has supposedly been around forever, but there’s no explanation given for why none of the Charmed Ones trained there. I’d suggest that instead the Charmed Ones help establish a U.S. based magic school after visiting Hogwarts. They would be motivated by a desire to help kids have an easier and safer way to learn magic than they did, learning on the fly without a teacher. The Charmed Ones vs. Voldemort! If the girls were at Hogwarts (as students or guest teachers) at the same time as Harry and Co., they’d be inevitably drawn into the battles with Voldemort. Voldemort would see the Power of Three as a threat, and would likely covet Phoebe’s power of premonitions as he doesn’t have reliable access to divinatory talents otherwise. During the period before Voldemort’s return, Deatheaters like Bellatrix L‘Estrange might try to steal the Book of Shadows in hopes that its magic could restore him. Awareness and Postcognition are Contingent on Precognition (-1 each). Detective (Clue Analysis) is a Powered Skill (-1) and is Contingent on Precognition (-1). Postcognition and Precognition receive a maximum of half RV in Knowledge Points (-2). Postcognition and Precognition are also Minor Marginal (-1), although HPs for Marginal use only need to be paid when Phoebe ’calls’ a premonition; premonitions “triggered” by chance or by the GM to move a story/adventure along are ’free‘. See the section “Unfogging the Future” below for details. Power Reserve can only be used on Ritual Magic attempts (-1); see “The Power of Three” below for details. Speak with Spirits allows her to see and hear ghosts and other magical creatures (+0). Expansive Headquarters (Halliwell Manor), Familiarity (cars, current trends in fashion and pop culture), Magic Background. Piper (High), Prue (High), Bouncers and clubbers (Low). Power Loss (If Phoebe time travels to a point where she already exists at another age, only the self native to that time period will possess her powers), Price of Magic (see below), Secret Identity. The Book of Shadows (separate entry — note that Phoebe typically uses its Occultist Skill in place of her own, including roughly 8 APs of Ritual Magic). Phoebe did not have Postcognition until episode 9 (The Witch is Back). She did not display Martial Artist until episode 16 (Which Prue Is It, Anyway?). Prior to that, her DEX was 03, she had no Martial Artist, and her Initiative was 13. Phoebe gains skills in the martial arts remarkably quickly, especially considering that she’s self-taught with nothing more than a training dummy to help her. Later seasons will suggest that her innate power as a witch helped her develop her fighting skills. In game terms, this probably just means that her adventures helped her earn the Hero Points (HPs) needed to buy the Martial Artist Skill much faster than a normal person would. 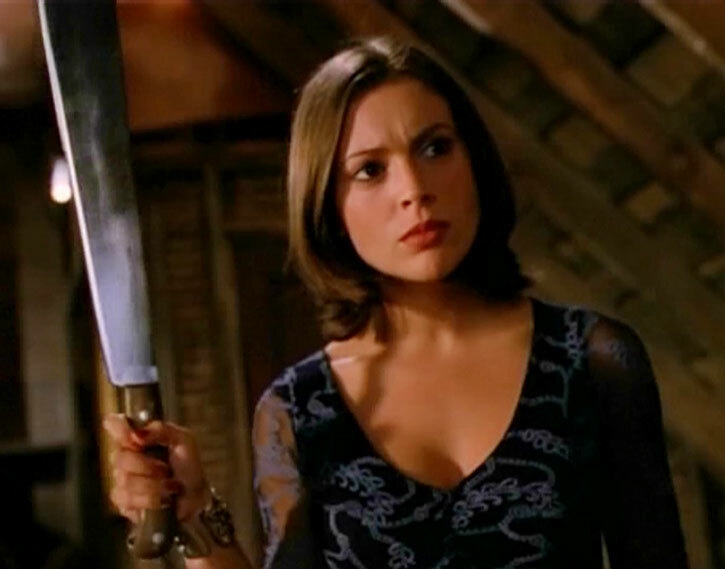 In late seasons of Charmed it will be made explicit that Phoebe’s premonitions help her anticipate attacks and give her the equivalent of Enhanced Initiative, but that’s not in evidence at this stage. Speak with Spirits represents the ability to see and hear ghosts that normal people cannot, at least when the ghost wants to communicate. It doesn’t include any ability to summon spirits. It simply means that Phoebe can perceive ghosts who are present and want to communicate. Some GMs and Players may prefer to represent this with True Sight (limited to perceiving ghosts). The Book of Shadows will get its own entry and is not included here. For rough Benchmarking purposes consider it to have 8 APs of Occultist (at least the subskills of Ritual Magic, Create Potions, and Occult Lore) and an Expertise in Demonology and witchcraft. As with many fictional psychics, Phoebe’s visions of the future and the past are less immediately useful than one might expect. Phoebe’s premonitions are mostly a plot device. She can see what the writers want her to see and nothing more. If the writer (or GM) needs a quick and easy way to begin an encounter, having Phoebe suddenly get a vision will do it. But the vision can’t be allowed to foretell everything or there’s no tension in the story. Because the writers want to save some surprises to reveal in the course of an episode, her visions almost always give partial information. As a result, Phoebe’s visions of the future are incomplete (represented in Game terms by the half RV Limitation), and they don’t occur on a regular basis, usually only once or twice an episode (represented by the Marginal Limitation). There’s good reason that Phoebe at first considered her power passive and mostly useless. It’s very difficult for her to call a premonition at will, and when she does, it never tells her everything. But as her ancestress Melinda Warren pointed out, there is a rationale at work in what she sees. In the Charmed Universe there is a strong belief that everything happens for a reason, including Phoebe’s visions. Her glimpses of the future and the past aren’t primarily intended to benefit her or help her avoid trouble. On the contrary, they usually get her into trouble. Her visions are geared to protection and healing. That is, she sees visions of people being hurt, giving her and her sisters the chance to prevent it. And she sees visions of past hurts, giving her a chance to comfort the afflicted and right the wrong. Reflecting this in the game means her powers need to work differently than in the Rulebook. In the standard form of Precognition and Postcognition, the difficulty of getting a vision is determined by how far in the future or the past the vision is. OV/RV is equal to APs of time. Phoebe’s power doesn’t work that way. She can see a vision of 9 months in the future with the same clarity as a vision of tomorrow or of 300 years ago. Conversely, visions a short distance into the future or the past are just as unclear as those of long ago. Many of Phoebe’s visions will simply be crafted by the GM in advance to start off a Story or Subplot, and so it may not be necessary to worry about dice rolls or other game mechanics. The GM can just relate the vision s/he has prepared to Phoebe’s player (or perhaps write it out so that only Phoebe’s Player can see it). But if the Player and GM want an element of chance involved, where dice rolls (and Hero Point expenditure) determine if Phoebe gets a vision and how detailed it is, then I suggest the GM should set a Difficulty Number for the vision on the Universal Modifier Table. The Difficulty Number should be based on the importance of the vision to Phoebe’s calling as a witch and a Charmed One. The more closely connected the vision is to protecting an innocent or helping someone avoid hurt, the more likely she is to see it. While Phoebe certainly can see mundane events, she’s much more likely to have visions involving magical dangers. Visions of mundane threats, like car accidents, occur a few times in the first season. Visions about demons and warlocks occur nearly every episode. Her most powerful visions (like the one of Melinda Warren confronting Matthew Tate 300 years ago) involve threats to the Halliwell line itself. Seeing the winning number for a lottery ticket has nothing to do with her calling and is also forbidden as a form of personal gain (as explained below). So we might consider that task Herculean (OV/RV of 12/12). Seeing a car accident would be Strenuous (OV/RV of 06/06). Brushing against a warlock and seeing him attack his next victim would only be Difficult (04/04). Unless, of course, the warlock is aware of her and her power and wants to avoid her notice. Then treat it like a Perception Check – using her APs of Precognition as AV/EV against the demon’s INFL/AURA as OV/RV. The severity of the danger seems to play a role, too. Foreseeing an “ordinary” attack on her family, which happens all the time, might be Strenuous or Difficult. Foreseeing an attack by a warlock which is ’destined‘ to kill one of the Charmed Ones might only be Average, automatically succeeding. On some occasions Phoebe’s Player may decide to try and ’call‘ a premonition. Generally that would mean seeing a vision that doesn’t fall into the categories mentioned above (designed by a GM, involving danger or healing, involving magic, relating to a threat to the family destiny, etc.). In these cases, it may be helpful to revert to the standard forms of Precognition and Postcognition, and use the APs of time to set OV/RV. This doesn’t happen often in the series. It requires concentration (and a period of training) on Phoebe’s part. To simulate this, I suggest that deliberate Precog attempts be Minor Marginal, costing HPs to use. She successfully calls a premonition for the first time very late in the season, but it’s never a skill she can count on. In other words, the Marginal Limitation never actually goes away — it’s just that she has earned enough HPs to be willing to pay the fee for that episode. In fact, she probably earned some of those HPs by doing her training and meditation exercises. In all cases – whether a vision is ’scheduled‘ by the GM, triggered on the UM Table, or called by the Player – Phoebe’s success should be capped at ½ RAPs or less. This means there will always be something left out of the vision, requiring Phoebe (or her Player) to figure some things out. Also of note is that Phoebe’s premonitions give her the Game equivalent of Detective (Clue Analysis). Often at the scene of a murder, or when handling a murder weapon, etc., she’ll get a vision of what happened or of the killer’s next move. Phoebe is one of the Charmed Ones, three sisters prophesied to become the most powerful witches the world has ever seen. While each is powerful alone, their true strength is rooted in their collective bond as sisters – the Power of Three. In game terms, when all three sisters are together and are using Ritual Magic, Power Reserve becomes available and is added to the Effect of the successful Ritual. Her sisters likewise have this Power Reserve. Note that the Power Reserve is not added to the Casting Roll for the Ritual; the Charmed Ones can fail in casting a spell like any other spellcaster. Instead, after they succeed (usually Team Attacking the Ritual to increase their chances of success), their collective APs of Power Reserve are added to increase the Effect of the spell. The result is that a spell cast by the Charmed Ones using the Power of Three is more powerful than for other spellcasters. By Chris Cottingham & Ethan Roe. 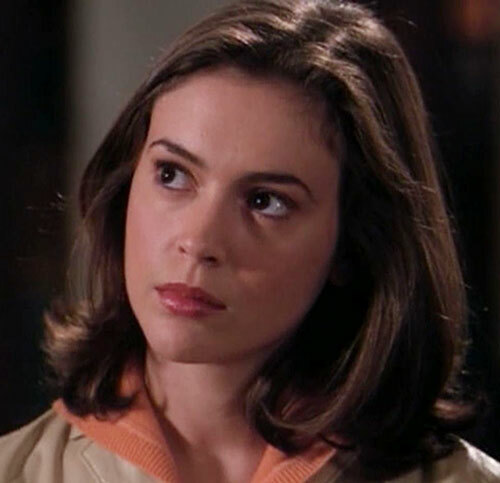 Source of Character: Charmed (TV series); Character portrayed by Alyssa Milano. Helper(s): Marcello, the Charmed Wiki (a handy quick reference, though the information must be double-checked). Writeup completed on the 15th of February, 2014.